India has always been criticized for underperforming in away test tours. But the first two tests of the 2014 India’s tour of England shows that all of that has just changed. We had a captain who was being criticized for being too defensive in away tours, a very fragile batting line-up and a very ordinary bowling line-up. With an inexperienced side, MSD has managed to do something that had only been done once before by Kapil Dev in 1986, a test victory at Lord’s. Brazil vs Germany - Kids, close your eyes!! How do you review a 7-1 trouncing? How do you sit down to write and not laugh? Whatever Germany did last night was an absolute annihilation! 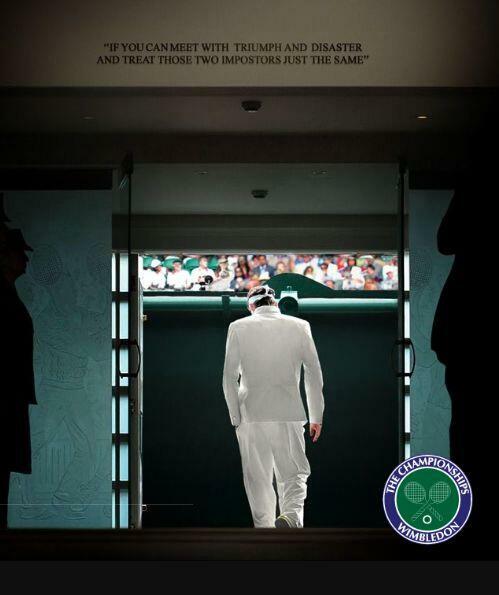 Roger Federer - Wimbledon was not 18, but so much more! 6th July 2014 was a very special day for all tennis lovers but even more so for Novak Djokovic and his friends, fans and family but something really special happened that day, you know what? I am sure you do, I am sure you have heard it, or read about it, I am sure you are inspired by it. I am talking about the ageless legend Roger Federer. Australian teenager Nick Kyrgios yesterday brought the world’s attention to something other than football i.e Wimbledon. Nick defeated current World No.1 Rafael Nadal in four sets with some beautiful play on the centre court. 2 minutes with Sunil Chhetri - Our beloved captain! So our very own Café Rio lads Sunil Chhetri and Mikael Silvestre decided to play some fun football as a change from their daily routine of staying up all night carrying out the match analysis/discussions, and of course, introducing Silvestre to the Indian turf and feel of football. Since the studio is located in Mumbai, they looked up for the best futsal ground in the city to play and chill at with their I-league mates. “KickForAll” in the posh area of Hiranandani, with the ground isolated, located at a height and overlooking the massive skyscrapers, provides the most thrilling experience of a 5-a-side football match, and our lads couldn’t have found a better place in this otherwise crowded city. France were the clear favourites ahead of the game because of their splendid form in the group stages. Having said that, everyone knew Nigeria will be no pushovers! So we had two extremely impressive teams based on their group stage performances square off against each other in probably the hottest (in terms of temperature) game of this world cup. Well, sums it up, doesn't it? What do you do when you are the better team and still go out? The match was rather dull, I may have dozed off 2-3 times. Matchday Recap : Suarez, you want some Parmesan with that Chiellini? So we basically had two heavyweights in a virtual knockout game and we were still in the group stages. With both these teams impressing and knocking out the defending champions Spain in this World Cup, this promised to be an interesting match with a 'winner takes all' scenario.